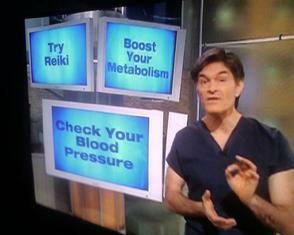 By now I think you’ve all heard about the Dr. Oz Show on alternative health care. On a recent show Dr. Oz profiled some alternative medical treatments as a “vista of opportunities” that he believes are valuable for wellness. Some of the treatments seen on the daytime show were clay baths, cupping, aromatherapy and Reiki. According to Oz, “Reiki is the most important alternative medicine of all! “ He further remarked that Reiki “broadens the spectrum of where we’ll go in our bodies in energy medicine”. These comments made by this esteemed Columbia University heart surgeon are a tremendous credit to Reiki as a respectful therapy for public consideration. To further Reiki’s positive reputation, Dr. Oz mentioned that his wife was a Reiki Master who often treated their children as well as himself with the warmth of her Reiki hands. He acknowledged that Reiki energy works deeply on cells and tissues of the body. He then introduced Pamela Miles, a Reiki Master from NYC who has been in the operating room with him. She demonstrated giving Reiki to a woman who had a headache. She explained Reiki as a “balancing practice”. Miles further explained that symptoms tend to fall away with continued Reiki and “over time they’re less frequent”. This comment allowed Reiki not to be seen as a quick fix or miraculous healing technique, but rather a slow and steady energy treatment that will bring balance with consistent use and practice. Miles’ comment on Reiki’s balancing ability explains Reiki as a gentle force that works with the body’s own rhythm without influence of the Reiki Practitioner. Though the show was brief, it did bring much positive Light (! indeed) on Reiki as a valuable and respected healing therapy. In conclusion, Dr. Oz says that energy therapies will become more prevalent in the next few years. This is so hopeful to all of us Reiki practitioners. It is a lesson in patience and divine timing. Many of us knew this awakening would come, but didnt expect it to be from a NY Surgeon on national TV! What a great way to begin the New Year and new decade! If you go to You Tube and type in Interesting Reiki Recommendation you will see the 2 min. video from the Dr. Oz Show.